If you want your own ‘bag for life’ and feel guilty about all the plastic bags you have lying around, kill two birds with one stone and use them to knit your own shopper. You could also use them to knit (or crochet) hats, scarves, coasters, placemats and more. This project is suitable for beginners but if you’re totally new to knitting, look for tutorials online for how to cast on and knit a stitch. Cut the handles off the carrier bag. Flatten the bag out and cut it into a strip. Cut in a spiral around the bag so that you end up with one long strip. Cast the first strip on as you would if you were knitting with wool. Keep knitting until you are nearing the end of the strip. Then, tie on the next strip. Continue knitting until you have a rectangle shape, in the size that you want your bag – that is the full size, because the next step is to fold the rectangle in half. Cast off, like you would in a normal knitting project. Fold the rectangle in half to make your bag. Stitch the sides together – you could even try stitching with very thin strips of carrier bag with a large-eyed needle or embroidery needle. The next step is to knit the handles. Do this in the same way as you did the body of the bag. You can make them as wide or long as you like – try six stitches wide for starters. Sew the straps on as you sewed the sides of the bag together. Be patient! Knitting with carrier bags can be a little tricky at first and is different to knitting with wool. You will get used to it as a material, though. The thicker your plastic ‘yarn’ strips, the stronger your bag will be. Start to experiment with pockets and designs once you have the hang of the technique. 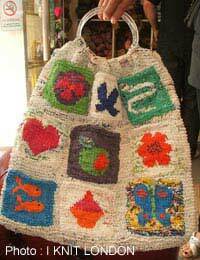 Experiment with colours – look online for examples; some knitters have made really striking bags. You can also make items such as bowls; cup holders; purses and more. You could also try to crochet with plastic bags. Knitting with bags is quite noisy so not a knitting project to take to the cinema! If you don’t like sewing seams, you can knit a seamless bag. If there is still use left in the plastic bags, use them to the end of their life before knitting with them. You can use holey bags, but you won’t be able to use the strips with holes in. Some people call plastic yarn plarn.